It wouldn't be a Saturday if there wasn't a big 'ol Macy's offer. Today they are having a massive one-day sale with discounts throughout the store. Bonus: All clearance items are an extra 25% OFF. Yep, a discount on top of discounted items. 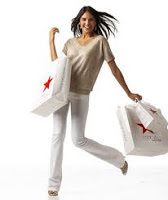 Get some designer clothing, appliances, jewelry, shoes, bath or bed items, and everything else you know Macy's sells. Just do it by close of business Saturday to get the discount. I recommend starting with the Web buster deals they are promoting off their home page. Click here to shop the sale at Macy's.